Gum disease is the fifth most prevalent health problem among Australians. Whether your gum disease is halted, slowed down, or becomes much worse all depends upon how you approach your daily dental care routine, as well as how strictly you adhere to regular dental check-ups. Gingivitis: this is the first stage of gum disease. It occurs when there is inflammation of the gums. Your gums will become red and swollen and will bleed easily. However, this form of gum disease does not include any loss of bone or tissue that hold your teeth in place. 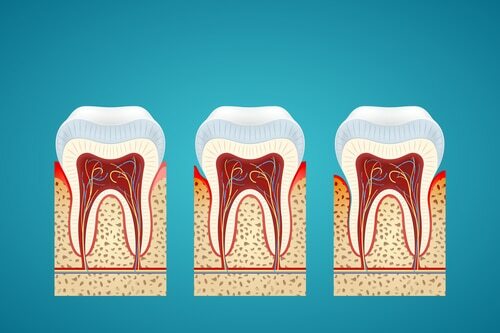 Periodontitis: this is a more serious form of gum disease that affects not only your gums and soft tissues, but also the bone in which your teeth sit. The bone loss caused by periodontitis is irreversible, and can lead to mobility and subsequent loss of teeth if not treated. A thorough scale and clean and good home care is essential to the treatment of gum disease. For those with periodontitis, a deep scale and root plane procedure will have to be performed. This may need to be done over more than one visit and may or may not need to be done under local anaesthesia to ensure patient comfort. For severe periodontitis, laser therapy together with antibiotics will be advised. If gum disease is left untreated, in severe case, it can progress to periodontitis and even result in the loss of teeth. Treating gum disease early is the best way to prevent missing teeth. The condition of your teeth and gums is closely linked to your overall health and wellbeing. By maintaining the health of your gums, you improve your overall wellbeing. Often times, a range of side effects that make everyday activities quite painful accompanies gum disease. These side effects include bleeding, tender and puffy gums. Treating your gum disease will get rid of all these problems. Generally speaking, if you suffer from gum disease, you also suffer from halitosis (more commonly known as bad breath). By treating your gum disease, you should find that your bad breath disappears. Gum disease is often accompanied by bleeding gums. Treating your gum disease will put a stop to this embarrassing side effect, improving your smile and your confidence.